Dolphin Trilogy is a wonderful way for you to connect with the healing power of dolphins. Dolphins have been used to help with therapy for children very successfully for a long time. Dolphin Trilogy consists of three attunements. 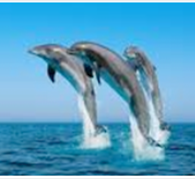 Dolphin Trilogy Reiki includes Dolphin Healing Breathing, Orca Empowerment Breathing, and Dolphin Crystal Breathing. You will receive a Dolphin Healing Reiki meditation, an Orca Empowerment Reiki meditation, and a Dolphin Crystal Reiki meditation. *Dolphin Reiki Attunement – assists you with healing and teaches you how to connect with the dolphins. *Orca Empowerment – helps to improve communication and release old, negative memories. *Dolphin Crystal Reiki Attunement – you will learn a complete healing system using Dolphin Energy and crystals together. This is a very powerful healing modality that can be used to heal on many levels. Dolphin Trilogy is wonderful for addiction, alcoholism, depression, acute sadness, and mostly for forgiving one’s self and helping you to become the smiling playful creature you are meant to be, and sing in joyful admiration!